Brussels, the capital of Belgium, is a small, walkable city with a population of approximately 146,000 in the central district, and over 1 million in the greater metropolitan area. Brussels is a city of fine food, café culture, and architectural gems from the medieval to the modern age. It is home to numerous museums of art, history and science, as well as quirkier finds like the Museum of Cocoa and Chocolate and the Centre for Comic Strip Arts. Brussels is a multi-cultural city that has two official languages—French and Dutch—and is the headquarters of both NATO and the European Union. Hobart and William Smith Colleges maintain an affiliation with Vesalius College, an English language division of the Vrije Universiteit Brussel. Vesalius has an enrollment of approximately 300 students from over 50 nations and is part of a larger university community of 10,000 students scattered through the city of Brussels. Students may take courses in communications, economics, European studies, history, international relations, politics, and sociology. A centerpiece of the program is a credit-bearing, intensive internship with a European organization, arranged for the students by Vesalius College. This program will be of particular interest to students in economics, history, political science, peace studies, international relations, and all aspects of media studies. Courses are also available in art history, linguistics and writing. Internships are offered with a wide-range of agencies from NGOs, to financial organizations, communications firms, legal/political and other institutions. This program is open to juniors and seniors in good academic and social standing who have a minimum GPA of 2.5. Due to the challenging nature of study abroad, student academic and disciplinary records will be carefully screened. Students may choose to reside in a homestay with a local Belgian family or in independent housing arranged by Vesalius College. All homestay families speak English and are within commuting distance of the University. Each student has his/her own bedroom and host families provide breakfast daily and dinner on weeknights. Students have access to host-family kitchen facilities to prepare their own meals (or they may choose to eat out) for lunch daily and for dinner on weekends. Alternatively, students may choose an independent housing option offered by Vesalius; this option is self-catering and consists of a furnished room in a local residence where students will have access to kitchen facilities and are responsible for their own meals. Excursions are not included in this program unless students enroll in ART 361 (the additional fee for this course is included in the cost of the program). Art 361 students will travel to six different European cities for day trips and a number of extended weekends. All travel expenses and admission fees are included on this trip. 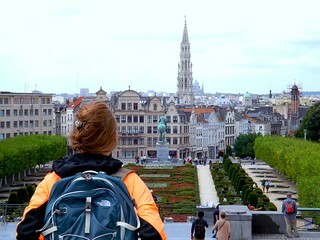 Students not enrolled in this course can plan their own cultural and personal expeditions in Belgium and beyond with the help of local travel agencies and advice from program staff. Students will be charged standard HWS tuition and room fees and a $600 administrative fee (those choosing the homestay option will also be charged ½ the standard board fee to cover meals provided through the program). This will cover tuition for a four-course semester, room, health insurance, internship placement if applicable, and meals as outlined above if in the homestay. Those students in a homestay should bring half of their standard board fee with them (approximately $1500) to cover meals not included through the program while those in independent housing should bring their full board fee to cover their meals throughout the program. Additional expenses not covered include airfare, books, visa and personal expenses (laundry, entertainment, ground transportation and independent travel). We estimate airfare for this program at $1100—$1300 from the East Coast, books at $250 and visa at $120. It is difficult to give an accurate estimate of personal expenses because student spending habits differ considerably. We would suggest a minimum of $1,500 above and beyond meal expenses. However, students on a tight budget should be able to manage with less. If you are concerned about finances, we strongly encourage you to talk to the CGE staff who can offer information and advice based on your specific situation.